Shahrzad has one thing one her mind - vengeance for the death of her friend at the hand of the terrible, horrible, no good, very bad Caliph of Khorasan. The rest of the description sums it up pretty well. Khalid isn't what he appears to be, and Shahrzad spends most of the book fighting her feelings for him. While I felt like the "night after night, Shahrzad beguiles Khalid, weaving stories that enchant, ensuring her survival" was a little light on actual stories, Ahdieh herself is a master storyteller. There are a lot of plot elements happening at once, and yet she manages to weave them together seamlessly. She also manages to avoid the pitfall of "I love him. I hate him. I love him. I hate him." The relationship is gradual but heartfelt. Of course, a lot of drama could have been avoided with actual conversation, but then there would be a lot less book. It's rare to find a teen series with only two books in it. Well done, Ahdieh, well done. The audiobooks were fantastic, and the fast-pace and interesting characters made this a quick, enjoyable read. There are a lot of unfamiliar names that take some time getting used to, but once you've been sucked in, there's no stopping. 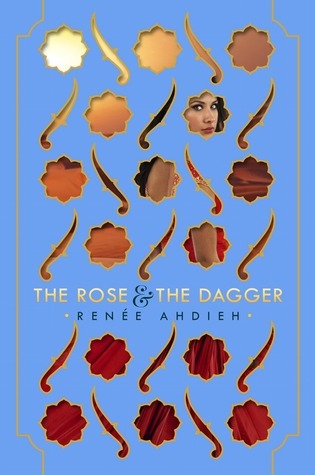 I highly recommend The Wrath & the Dawn and The Rose & the Dagger to anyone who enjoys a fun retelling, adventure, and a little bit of romance. And magic carpets. I'm now pretty sure I need a magic carpet. Life would be better with a magic carpet.